There are hundreds of colours and finishes available in Acrylic. 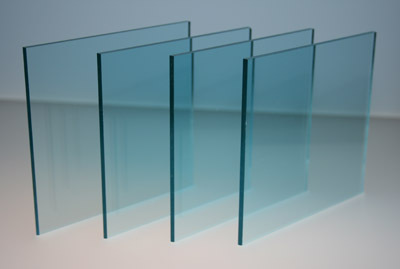 We supply cut to size in clear, frosted, solid and tinted colours in all the colours of the Perspex, Plexiglas, Policril, Altuglas and Repsol ranges etc. We hold many in stock & the rest are mostly available to us in 24 or 48 hours. This page shows the availability size and properties of clear and coloured Acrylics.There is more data on clear finishes and colours on the other tabs. Windows including greenhouses, garages houses, cars & boats. Photo glazing, display shelving, notice boards, diffusers & light covers, bathroom fittings, safety barriers, partitions, skylights, components. The list is endless for this very useful plastic that is available clearer than glass and in such a wide range of colours and surface finishes. POLISHED Acrylic Blocks for Photo-mounting and Acrylic blocks for stamping. click here to read about polishing. COLOURS These are mainly available in 3mm and 5mm thickness. 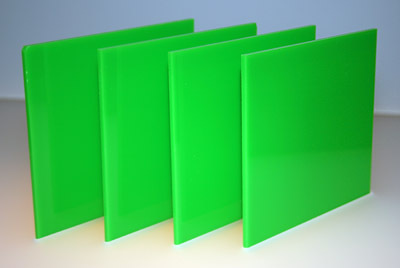 There is a small range of thicker sizes mainly in Opals 030 & 050, White, Black and some tints including the Glasslike Silicone Green Edge and Fluorescent Perspex Neptune Blue at 10mm. Please ask if there is anything specific you wish . For other colors with a thickness over 5mm they will probably have to ordered in a large number of sheets each 3 metres by 2 metres. 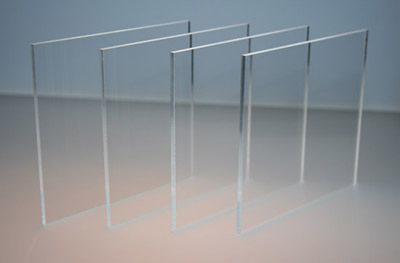 Clear 1.5mm is discontinued as large sheets are brittle and break in transit. If you need 1.5mm consider 2mm which is the same price as 1.5mm or Polycarbonate as ours has similar UV properties & similar clarity to Acrylic but is 10 times stronger. 2, 3, 4, 5, 6, 8, 10, 12, 15, 20, 25, (30, 40, 50, 60 & over please ask up to 400mm. Please ask. They vary considerably depending on area ordered. Minimum 1.5 by 2M order. We also do a range of Clear and Anti-Glare PET & APET products for smaller pictures. Other Colours Please read about availability of other colours on the Acrylic Colour Finishes tab above. Clearer and lighter than most Glass for glazing. 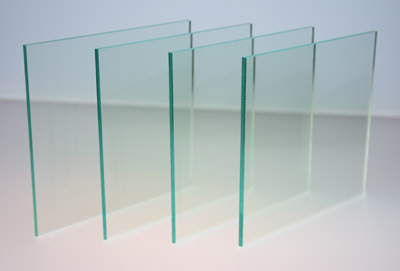 Good quality clear Acrylic sheet from major brands has a light transmittance of around 92%. Mouldable. Easily machinable. Can be joined with solvent based adhesives. The edges of Acrylic can also be finished to a high polish by flame , diamond and or buff polishing. Each method gives a different finish. Please read our page about polishing . It costs extra but in some situations is appropriate and can be well worthwhile. 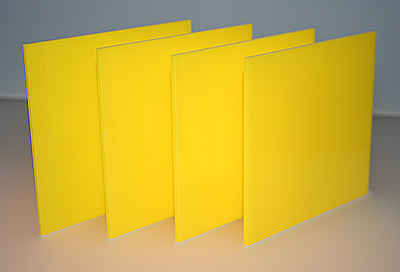 Excellent UV stability (that means it resists sunlights tendency to yellow plastics over the decades). Acrylic has excellent properties inside and outside. 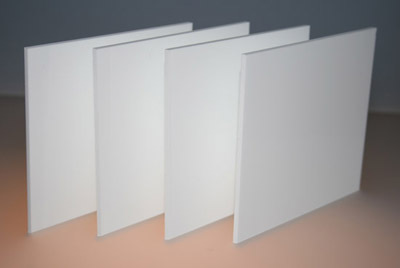 Acrylic sheet is an excellent thermal insulator. Its electrical surface resistivity is higher than that of most plastics. Good electrical resistance at low frequency. There are also OPAL grades where light transmission is reduced. One grade offers around 50% and another 30% light transmisson (see above). These can be used in light boxes for emergency lights or disco lights. We also supply SMOKED colours styles to reduce light transmission but still allow some vision. Fluorescents and live edge Acrylic click here for more details. Because plastic expands and contracts holes must be drilled the correct amount oversize. Acrylic, Perspex, Plexiglas, Plastic Sheet, Mouldable, UV Stability, Alkali Resistant, Clear Acrylic. Lightbox, Light box, Fluorescent. Polishing: This is the one material we supply that can be polished on the edges to a high gloss. This can be done by hand or machine and if you need it please tick the box on the enquiry form as there is an extra charge. Click here for more information. Acrylic is the plastic with the largest range of colours and surface finishes. There are several finishes that are not coloured and we have tried to show some here. Tinted Bronze (Slighty Brown tint) & Smoked ( Slightly Black tint) Both can be used for windscreens in boats, caravans, house windows where you wish to reduce the amount of sunlight. Many variations on the smoked are available but are difficult to show you. We do not always supply Perspex or Plexiglas brands but whatever we do supply will be of a similar tint. If the tint is critical then you can order a sample first. We also have some images of Opals & Bronze & Smoked Tinted Acrylics. Opal 030 and 050 on Black background. Opal 030 allows approx.70% light through and Opal 050 allows approx. 50% light through. Opal 030 and 050: With weak sunshine behind. Either can be used as a light screen or light box. Keep the plastic well away from the heat of the light if its likely to exceed 60 oC or more. The colours shown above represent the closest match we can show on a website. They are not exact as lighting, reprographic methods and different producers cause variation. Acrylic plastics have the largest range of colours & finishes of any common plastics. Colours are available mainly in 3 and 5mm thicknesses. A few colours are available with greater thicknesses such as Black White and Opal - please read the sizes chart on tab 1. A few other colours come thicker than 5mm but large minimum order sheet amounts are often required. Please ask. We can supply most colours from the Perspex®, Plexiglas® Altuglas® Policril® and Repsol ranges. Standard and Satin finishes alongside Frosted, Embossed, Prismatic Semi- transparent, Fluorescent, & Live Edge colours etc. CHOICE 1: SHELF STOCK: The range below is available cut to your size and you do not pay for a full sheet. CHOICE 2: 48 HOUR STOCK: If you do not see what you want in CHOICE 1please look at the range on the Perspex® chart: click here. There may be minmum order quantities for of 2000mm by 1500mm. Please ask. 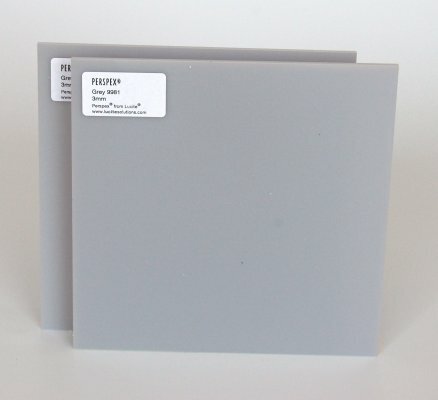 SOLID COLOURS - Normally available in 3 & 5mm thicknesses only. White, Black, and a few others are available in thicker sizes. Please see notes above. TINTED & TRANSLUCENT COLOURS - Normally available in 3 & 5mm thicknesses only except Clear, Opal and a few others are available in thicker sizes. Please see notes above. We hold stocks of the above colours and can cut what you need economically. There are hundreds of other colours where we do not hold stock but they are usually supplied to us by the manufacturer within 24 to 48 hours. These cost a little more as there are minimum amount we have to buy. Please see the Perspex Colour chart link below. Perspex® Colours - Chart attached - (Magnify to zoom in). click here. Acrylic (including Perspex™) - Mirror Finishes - Information on over 20 Mirror finishes is avaiable on request.